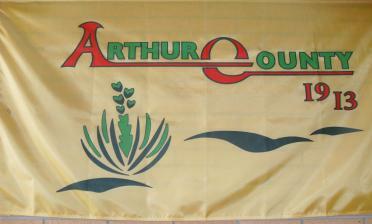 Arthur County is among those areas in Nebraska that carry the distinction of being land that has been under the flag of three different countries at one time or another. With the Louisiana Purchase of 1803, the area finally became part of the United Statest. Some historians believe the frontier ended by the 1890s, but Nebraska continued organizing counties into the early 20th century. In fact, although boundaries for what today is Arthur County were established in 1887, the county itself was not formally organized until 1913. 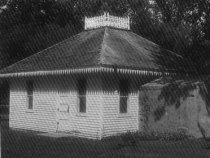 The courthouse that was built in 1914 and served the citizens for the next 48 years gained notoriety for possibly being the smallest courthouse in the United States. It was replaced by the county's present courthouse in 1962. Arthur County, named after President Chester A. Arthur, and McPherson County originally came under the jurisdiction of Logan County. In late 1889, McPherson County grew to where it could support its own government and, according to the laws of that time, what would become Arthur County came under its jurisdiction. With the Kinkaid Act of 1904, the area began to be settled at a more rapid pace. The increase in the number of residents and in tax revenues quickly put schools and local government on a more solid financial foundation. This southern Sandhills region grew from 517 inhabitants in 1900 to nearly 2,500 by 1910. It became clear to the inhabitants of the area that separate counties and separate county seats were needed. A letter appearing in the March 13, 1913 edition of the Hustler, Arthur County's first legal publication, noted "For the number of people and to dispense justice and liberty, would it not be best to make two counties and let Arthur County come back on the map!" State lawmakers were in agreement and during the 1912-1913 session of the Legislature passed a second enabling act authorizing Arthur County to proceed with its organization.